Indigenous front line workers make important relationships with youth in an effort to heal and house the next generation. Read what Kim Kakakaway, with the Boys and Girls Clubs of Calgary, has to say about the in-roads she’s made through her work on the frontlines in this guest blog, ahead of her presentations at the upcoming National Conference on Ending Homelessness in Hamilton from Nov. 5-7. I am Cree from Saskatchewan. I have always worked with Indigenous youth of all different backgrounds and locations. There’s common language and understanding as soon as I step foot in working with my own people. I have always had a passion to see healing within my own people and know how to connect with my people best. I have close family members who were and are experiencing homelessness, but I never imagined that I would be working on the frontline. There’s a barrier broken down right from the get-go when it’s Indigenous working with Indigenous and that is something I try my best to bring in to my Home Fire program and speak to for other Indigenous programs. There’s a common understanding of what family means, what community looks like, what native humor really is (words can’t fully explain our humor, but it’s my favourite thing) and how trauma is too much of the norm. My end goal is not just to see my youth housed – my end goal is to see my youth experience healing that changes the next generations to come. I want to see the cycles stop. I want to see unity between families, communities, nations and cultures. Home Fire has allowed me to try and implement that healing. Sometimes it’s a simple drive through the city with the youth so that conversations can happen. Other times it’s the really hard conversations and allowing natural consequences to take place … even when I wish I could step in and save them, I know that only does more harm and robs them from teachings and lessons learned. No one ever said this work is easy and I haven’t come across anyone who assumed it was easy either. What does healing look like? How does that happen? It’s different for everyone, but the areas I have found most healing has been through relationships. We are very relational people. Our ancestors lived in community among one another. It literally was a community raising the kids. Ask an Indigenous family who their mom is and it could be an aunt. Or a sister could actually be their cousin. I grew up with my biological sisters, but there was always a cousin living with us at any point in time. That’s how we as Indigenous people are. Relationships are key and sometimes it’s relationships that we as workers need to build with our youth. I had a youth who was only in my program for about six months. He moved in from out of the city and came to Calgary looking for new opportunity. Didn’t have a ton of family in the area, but needed change. He was deep in to drugs and alcohol. Home Fire was able to get him housed and then started working on his personal goals. I came in to work one day with a voicemail from the landlord stating this youth decided to have a ‘smashing’ party and his whole basement suite was destroyed. And I mean destroyed in that there was no longer a front door other than hinges hanging, and every wall was covered in something, writing, holes … you name it. It was ugly and I was mad. I picked up the youth from the unit and had a hard honest conversation. I told him I was mad, but also tried to understand what was going on in his world. He learned a lot of lessons that day, took responsibility, but was still given care and compassion. Long story short, the youth went and stayed at a friend’s house, but knew he was too stuck in his drugs that prevented him from maintaining housing. One morning he called me to pick him up so we could grab a food hamper. When I picked him up he was in a very low place and was very emotional. His words to me that morning were “the only safest place for me is right here in this car – I can’t be anywhere else”. My heart broke for him. We sat in silence as I drove and he cried. I didn’t know what words to say, knowing that he couldn’t stay with me in my car forever. I told him I had errands to run and he could come with me for the day. At the end of the day we had a conversation and created a safety plan. Shortly after that the youth decided to move back to where his family was. He was lonely and knew he needed his family to be successful. He needed those relationships in his life. Six months after he moved away I got a call at Christmas time. It was this youth telling me that he is sober, happy, and connected with his family. “I wanted to say thank you. You were the only one who didn’t give up on me in my darkest days and were the only one who believed in me, you kept me alive”. Oh my heart. This is why I do what I do. I never expect thanks but it has been something I have held on to. I want to always believe in my people so they can believe in themselves. How can we bring in more Indigenous workers on the frontline for our youth who are Indigenous? How can we strive hard to understand cultural family dynamics and work with it and not against it? How can we educate our own clients and families about inter-generational trauma? I will say – 6 years ago when I came to Boys and Girls Clubs of Calgary, I sat in on a two-day training on inter-generational trauma. Being educated myself in understanding my own family dynamics and the effects I see in my life due to inter-generational trauma, brought me so much healing. I understood my family on a new level. I went from anger to compassion within my own family. Let’s all work in educating our own people. My people. Your people. Okay … so I thought I was done writing this blog and went about my work day. It was near the end of the day and I was heading back to my office to finish up some paperwork and got a call. Low and behold it was this youth calling! Who I had not talked to since Christmas. I was speechless. He was calling to say hi and update me on his life. He has been sober for a year now. He said it hasn’t been easy, but he’s doing it and has such a clear mind. He loves being near his family. He said his heartfelt thanks again of how it meant so much that I never gave up on him and I believed in him through his darkest days. He asked if he is ever in Calgary can he speak to some of our current youth, because he wants to help others who are stuck in what he was only a year ago. He wants to believe in them as we believed in him. I shared with him how I was JUST thinking about and wrote out a piece of his story this morning on a blog. He was proud. We both laughed and I was still trying to get over the shock that he called. I could not stop smiling and was reminded again the importance of relationships in our healing. Catch Kim Kakakaway presenting twice at the National Conference on Ending Homelessness. On Nov. 5, she will present at the “Supporting Vulnerable Populations: Youth, Indigenous, LGBTQ2S+, and FASD Homelessness” session. On Nov. 6, she will be part of the “Exploring models of Housing First for Indigenous Peoples,” and in this session, participants will learn about four groundbreaking programs that have tailored and de-colonized the Housing First model to respond to the unique needs of Indigenous Peoples including youth. Kim Kakakaway is the Coordinator for the Home Fire Program with Boys and Girls Clubs of Calgary and has worked with the agency for five years. Home Fire is a Housing First program for Indigenous youth between the ages of 16–24 who are experiencing homelessness. 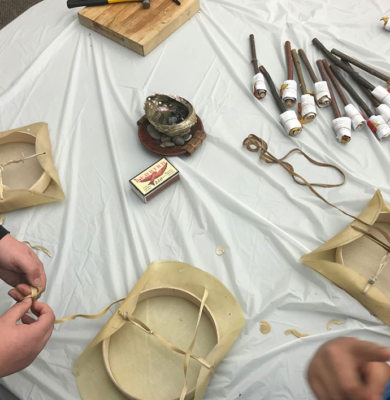 In this program she creates a home where they can begin to heal, build community and reconnect with culture and family. Kim is Cree, from Red Pheasant Cree Nation in Saskatchewan and has lived in Calgary from a young age. Kim has a Bachelor of Arts in Counseling and has been involved with Indigenous youth work for over 10 years. Kim has volunteered for over seven years in her community, with youth who are living in some of the most impoverished conditions in Alberta. She has a passion for empowering Indigenous youth to begin their healing journey, providing them hope, and connecting them back to their families and communities. 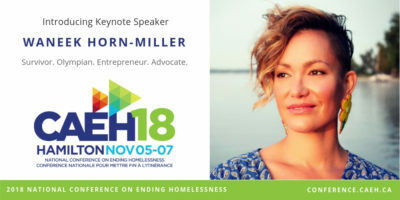 We are thrilled to feature survivor, Olympian, entrepreneur and advocate Waneek Horn-Miller as one of the keynote speakers at our National Conference on Ending Homelessness from Nov. 5-7 in Hamilton. If you don’t want to miss the keynotes, don’t worry, we’ve got you covered! We’ll be live-streaming our keynote presentations on our Facebook page. We will also be posting on Instagram and Twitter throughout the conference using #CAEH18! Don’t miss out!